Sub: State Govt. Employees Group Insurance Scheme, 1987 – Table of Benefits under Savings Fund for the year of cessation of Membership 2015-2016. In continuation of this Department’s Memo. No. 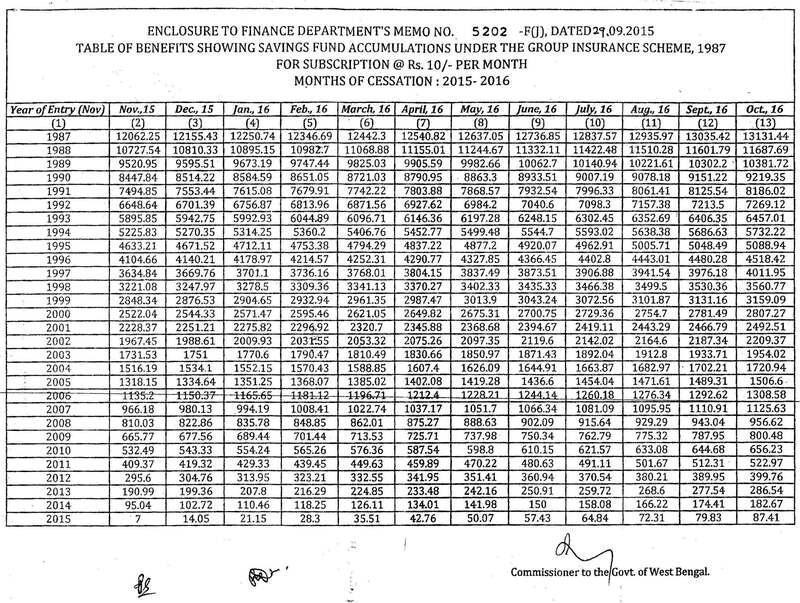 4700-F(J) dated 29.09.2014, the undersigned is directed to say that a new table of benefits showing accumulations of savings fund under the scheme referred in the subject, corresponding to a unit subscription of Rs. 10/- (Rupees Ten) only per month has been drawn up for the period from 01.11.2015 to 31.10.2016 in matching with Central Govt. Employees Group Insurance Scheme, 1980 circulated under G.O.I.’s OM. No. 7(1)/EV/2014 dated 22.01.2015. A copy of the said table is enclosed herewith as a ready reckoner. The figures have been worked out on the basis of interest @ 12% p.a. (compounded quarterly) for the period from 01.11.1987 to 31.10.2001, @ 11% p.a. (compounded quarterly) for the period from 01.11.2001 to 31.10.2002, @ 9.5% p.a. (compounded quarterly) for the period from 01.11.2002 to 31.10.2003, @ 9% p.a. (compounded quarterly) for the period from 01.11.2003 to 31.10.2004, @ 8% p.a. (compounded quarterly) for the period from 01.11.2004 to 31.10.2012, @ 8.6% p.a. (compounded quarterly) for the period from 01.1.2012 to 31.10.2013 and @ 8.8% p.a. (compounded quarterly) from 01.11.2013 to 31.10.2014 and @ 8.7% p.a. (compounded quarterly) from 01.11.2014 onwards. The mortality rate continues to remain unchanged. 3. The Amounts shown in the table are applicable to a member of Group-D category. Corresponding amounts for the members of higher groups may be calculated proportionately. 4. It is assumed that subscription have fully been realized from salary up to the month in which a member ceases to be in service, failing which the same shall be deducted with interest from his/her entitlement.